The full line-up of Tasty6's milks and juices. Today's spotlight is on Tasty6, a DC-based company that specializes in providing delicious, nutrient-dense foods and juices. Their mission is to combine Western nutritional science with Eastern healing wisdom. Essentially, they take their knowledge of each ingredient's nutritional functionality and integrate it with the ancient healing science of "Ayurveda," which uses the principles of nature to maintain health in a person. This results in a unique, super-nutritious menu of balanced and healing juices and foods. Let me preface this by saying that I LOVE the idea of doing cleanses. I may complain the entire time while doing them, but any opportunity to clean out my system of any toxins and I'm all over it. 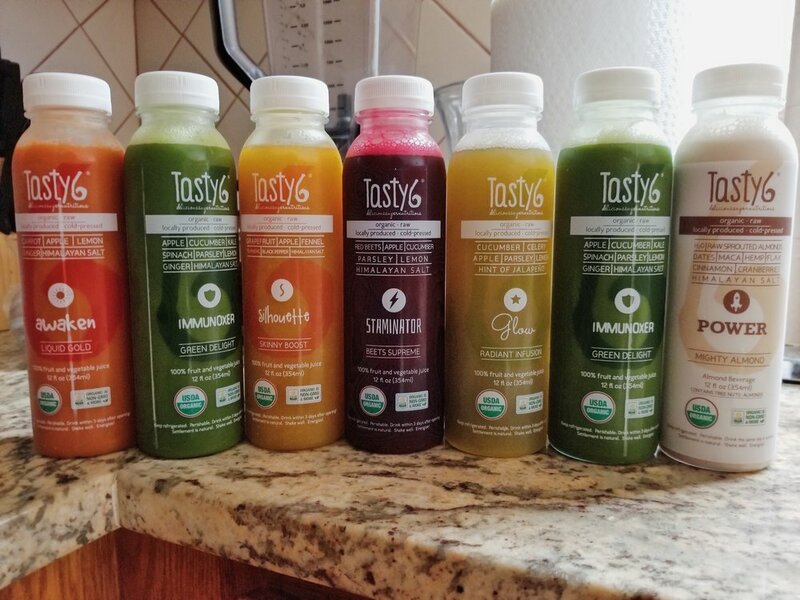 When an old high school friend approached me about Tasty6 and all of the cleanses and juices they have to offer, as a bride-to-be (at the time), I was all about it. I'm an event planner, so my schedule's pretty hectic and I don't have a lot of time for loads of prep, so the pre-packaged 3-day cleansed seemed like the perfect fit. No cooking for three days? Where do I sign! I received a great welcome email two days before I was supposed to start, detailing everything I was going to receive and what I needed to do to prepare. I loved that my welcome email also included mindfulness suggestions and encouraged not only a physical cleanse but also a spiritual one. The next day I received a call that my cleanse had arrived. When I went to retrieve it, I was expecting a random courier but instead I was greeted by a Tasty6 employee! What a great way to start. was the Staminator (red beets are the main ingredient). It is very beet-y and strong, but I finished it like a boss! The second half of the day I felt like I was rushing to drink all of the juices. I hope that tomorrow I have a better handle on the timing. The last juice of day was the Mighty Almond. I don't like milk or anything close to it unless mixed with my coffee or ice cream. I struggled. I did not pass go or collect my $200. This drink fell into the abyss along with my Chia Breakfast Bowl. Who told me to do a cleanse over a weekend? I have got to start making better decisions. Of course on this day I have a full day planned, including a birthday bar crawl (did I mention you can't drink on this cleanse?). Thankfully, I have an insulated lunch box and those handy-dandy ice packs, so I took my juices on the road. While everyone was taking shots of whiskey, I was taking shots of Tasty6! All jokes aside, I was happy that I could be so mobile and not have to worry about how I was going to stay on task. Today I was in the groove as far as timing goes, so I didn't feel the pressure of having to rush. I also started to physically feel lighter. Even got compliments that my skin was glowing! This may be TMI, but we're family right? I thought I was going to have to use the bathroom a lot but I didn't. It's the last day, woo hoo! I woke up legitimately feeling lighter and my typical cravings for sugar weren't as overwhelming. I finally was accustomed to all of the juices, even the beet one wasn't difficult to finish. Maybe since it was the last day, my willpower to finish was just stronger. I also decided to skip all of the food items today and just do the juices. I still felt satisfied and wasn't hungry at all. Overall, I enjoyed the cleanse. A few of the drinks like the Silhouette (above) and the Immunoxer, I can see myself regularly purchasing to drink. I didn't particularly enjoy the food options; I definitely would've preferred a juice-only option if they had it. Three days was the perfect length of time! Long enough that I could feel the difference, but not so long that I wanted to chew my arm off. I'd definitely recommend this, it's a great jumpstart to a diet/lifestyle change or even just a quick refresh. 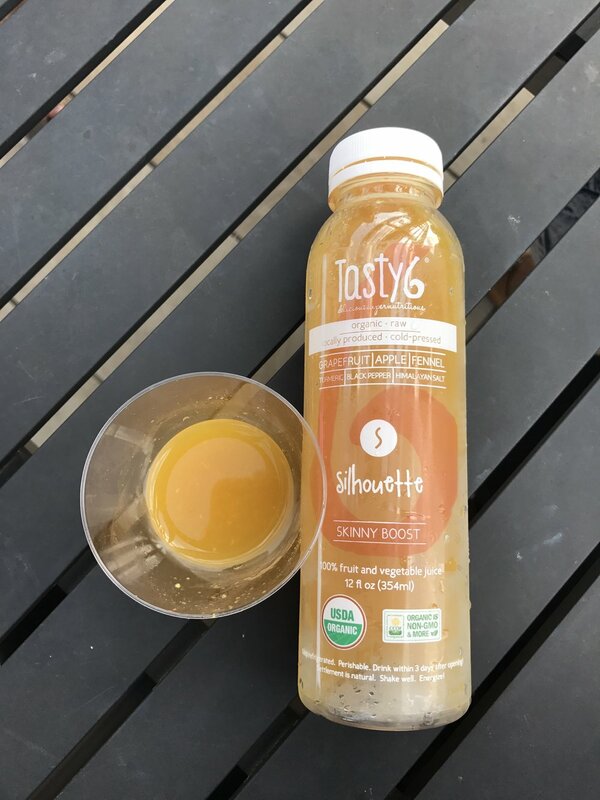 Our friends at Tasty6 have graciously given us promo code so that you all can enjoy the benefits of their amazing juices too! Use the code FAVOREDBYYODIT at checkout for 20% off your first purchase. To see where you can find Tasty6 locally, check out their 'Where to Find Us' page and be sure to let us know what you think! Celebrate National Pi Day with Pie Bar Ideas For Your Wedding! Fifty Shades of Grey: Modern City Chic Style Shoot Featured in The Knot!